Members of Danish team participating in Investigative Journalism Workshop. Sidonia editor-in-chief Ghassan Zaatari taking workshop test. Lebanon’s LBCI TV senior correspondent Tania Mehanna discusses coverage of investigative stories as ARIJ member Daoud Kuttab looks on. 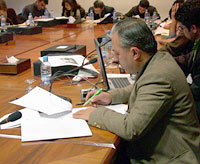 Lebanese, Syrian and Jordanian reporters attend Investigative Journalism Workshop in Beirut. 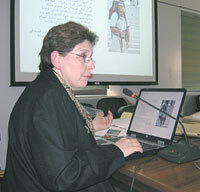 IPJ director Magda Abu-Fadil demonstrates computer-assisted research and reporting. IMS Executive Director Jesper Hojberg, ARIJ member Ibrahim Hamidi and Danish journalism professor Lars Kabel take a break. Dr. Mahmoud Tarabay lecturing about online journalism. The Institute for Professional Journalists organized a Danish-funded workshop on investigative journalism that drew reporters from Lebanon, Syria and Jordan to discuss the duties and responsibilities of investigative journalists, story ideas, research, designing projects, ethics and the use of modern technology. Danish experts Pia Thorsden, of the Danish Association of Investigative Journalists FUJ, Prof. Lars Kabel of Denmark’s School of Journalism, and columnist/Middle East expert Anders Jerichow of the daily Politiken assisted in the workshop’s tutoring. They were supported by IPJ director Magda Abu-Fadil, Dr. Mahmoud Tarabay of the Lebanese University and Lebanon’s LBCI TV senior correspondent Tania Mehanna who shared practical experience and exercises to illustrate examples of good and bad investigative assignments. 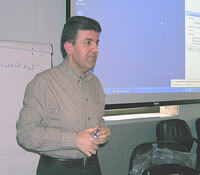 The workshop, planned in cooperation with the Arab Reporters for Investigative Journalism Steering Committee and Danish-based International Media Support, was held at the Lebanese American University’s Beirut Campus from January 10 to 12, 2005. The ARIJ Steering Committee groups Mr. Daoud Kuttab (AmmanNet), Prof. Nabil Dajani (American University of Beirut), Mr. Ibrahim Hamidi (Al Hayat daily newspaper) and Ms. Magda Abu-Fadil. The committee was formed following meetings in Copenhagen in August 2004 and in Damascus in October 2004 and organized by IMS. The initial project involves Jordan, Lebanon and Syria, with a view to expanding its scope to include other Arab countries at a later stage. IMS is the coordinator and organizer of the meetings that are to lead to various investigative journalism projects, followed by evaulation of the program to decide whether to expand it to include more journalists. The Steering Committee will remain loosely defined during the “Inception Phase” until a decision is made on the future structure and level of the project’s organization. The Committee is to give weight and backing to journalists involved in investigative assignments vis-a-vis their editors and managers and will provide financial compensation for lost working time/salaries. It will further undertake negotiations at the request of participating journalists and provide legal assistance, should the need arise.